UNE’s Dr Mary McMillan chosen for ground-breaking program, helping to close gender gap in science. 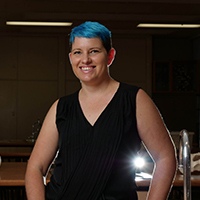 Dr Mary McMillan, lecturer and researcher at the University of New England (UNE) has recently been selected as one of 75 women across the world to participate in this year’s Homeward Bound Program, which aims to influence and support women in science. The program recognises that women make up a significant percentage in the workforce as university graduates, however are in the minority globally when it comes to executive decision making roles. The Homeward Bound Program sets out to arm women in science with leadership and strategic skills, and a developed network so they will be able to “impact policy and decisions towards a sustainable future”. Dr McMillan has completed a Bachelor of Science with Honours at UNE and has a PhD. She now works at UNE as a Lecturer in Biomedical Science and participates in the Behaviour Research Group. At the age of just 33, Dr McMillan has already had such a successful career, although despite her achievements, when applying for the Homeward Bound Program she doubted herself. “It took me a while to work up the courage to put the application in”, she said. According to The 2017 Women’s Agenda Report when women were given a list of obstacles they believed could get in the way of them achieving success in their careers, 51% of women ticked a ‘lack of confidence’. Further to this, Australia’s Chief Scientist revealed fewer female than male graduates in science, technology, engineering and mathematics (STEM) earn in the top income bracket, and 17% of STEM professors are female, even though around 40% of junior STEM academics are female. “Women are so capable but we tend to doubt ourselves and tend not to put ourselves out there as much as maybe our male colleagues,” said Dr McMillan. The Homeward Bound Program aims to equip women with skills and build their visibility so they can move up into management positions; and so they can assist others to do the same. This program will help develop the leadership and strategic skills necessary for me to move forward in my academic and research career, and to help me inspire the next generation of young scientists. Dr McMillan is already inspiring the next generation of young scientists, participating in a program called Curious Minds which aims to assist young women realise their potential in science. “The program links female students in grade nine and ten who have an interest in science with a mentor that is working as a scientist,” said Dr McMillan. The Homeward Bound Program which assists Dr McMillan in such educational programs, has already begun. The participants meet monthly over the course of the 12-month virtual leadership program. In December 2018 the group will then set-off on a three-week expedition to Antarctica where they undertake 12 days of state-of-the-art leadership, strategic, science and visibility training. The cost for Dr McMillan to take part in the Homeward Bound Program is $15,000. If you would like to donate please visit her MyCause page.